Here’s some good news for everyone who doesn’t like monotonous tasks. From now on, updates of your themes and plugins will be automated. 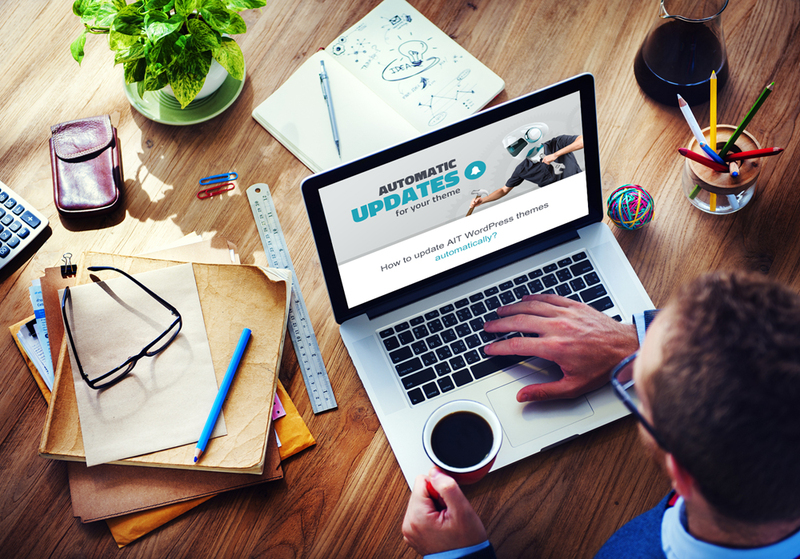 There’s new WordPress update available for your purchased premium theme or plugin. You’re glad to see security enhancements, addition of new functionalities, bug fixes etc. You know your website will be secure. Than you realize all that boring process of theme or plugin update installation is ahead of you all over again. we said at our AitThemes team and prepared automated updates for all our clients. Comfortable automated updates with AIT Themes from now on. Depending on scope of changes we’ve made there will be updates available for plugins, themes or both. You will see in Dashboard directly what needs to be updated. Thanks to that, there will be no need for manual upload of AIT Themes, plugins or Revolution slider and their one by one activation. We will be also sending you newsletters to keep you informed on all news and updates. Our top priority is to protect your website. With the newest version of WordPress Theme and Plugins you can be sure that the security is on the highest level. At AitThemes we’re working hard to keep you in a loop of all news and to make the process of actualisation as simple as possible. Newest versions of themes and plugins are also available on your account at www.ait-themes.club. You can log in, download and use installations files for new domains any time. You can updated your website the old way too. Which themes will be fitted with automated update? Themes available at www.Ait-Themes.Club. All themes from group “Translated and Multilingual” and “WPML Ready”. Themes available at Themeforest marketplace only. New Ait Updater plugin will be gradually introduced to all themes. We’ve started with our latest themes build on Ait Framework 2 which includes Hoteliour, Typo, Sportclub, Retro, Band, Sushi, Gourmet, Langwith, Solitudo, CityGuide, Spa, Widescreen, Coffeebar, Anchor. Automated update for these “Translated and Multilingual Themes” includes language plugin and translation files. When will the AIT Updater plugin be available? Themes available and sold via Themeforest only – will be available in next few weeks. We need a bit more time to develop the plugin due to implementation of Themeforest API key. Today we have released new version for themes available via Themeforest only. Please check you theme and download update compatible with AIT Updater plugin. Only if you have the latest theme version installed then you can download, install and set up plugin itself. How to make the updater plugin work? You need to install a version of the Theme that includes AIT Updater. Translated and Multilingual Themes – On Tuesday, 12. May 2015 updates for all Translated and Multilingual themes has been issued (Ait Framework 2). Login to your account, download installation package and install it. Warning: It is important to follow the procedure of theme update using “Easy Theme and Plugin Upgrades” plugin. Login to your Ait-Themes.club account and download the latest version. Upload to your website. After the upload and theme activation to the latest version AIT Updater plugin is installed and activated automatically. Go to Theme Admin / AIT Updater, please link your user account (Ait-themes.club) to your website here. Type in your API Credentials. Fill in your user name and AIT API key. You can choose to create backup of your plugins and themes before the automated update is made. It is recommended to tick this option to keep the previous working version in case of unwanted changes. If there are no API credentials filled in in the Theme Admin / AIT Updater the automated update won’t be allowed. If you’ve decided to use automated update going forward, there’s no need to store “Easy Theme and Plugin Upgrades” plugin. This can be deactivated and deleted. Please remember that all individually made changes to Theme’s source code will be overwritten by the automated update. How to prevent it? Use the old way of Theme’s updates. Use SVN system of theme administration. Currently we’re working on additional changes in our internal system where change log files and issued updates are being administrated. You will be notified automatically which files have been changed. Are you creating websites for clients who are editing content themselves? If you do not wish to use automated updates, please deactivate the AIT Updater plugin. I’ve purchased yesterday Directory from Themeforest, but today I’ve seen City Guide on your new website. May I have a special offer / refund to upgrade to City Guide? thanks for interesting in our products. We are sorry, we are not the owner of the Envato Makret through which you have bought the theme Directory. You should ask for money refund. Anyhow, if you are familiar with the directory listing theme with translated page builder, admin and front end, I have a good news for you. We are going to release new update of the Directory theme in some days. I believe you’ll like the upgraded theme with the similar features that you have encountered with theme City Guide. hi, i have a problem, I love my Ait theme but for some reason It did not come with the mobile plugin i tried using wptouch but it doesn’t work and to make matters worst I need to reset my password (I forgot It) and I live in the US different time zone , could you help me please with my plugin issue? thanks for your message. 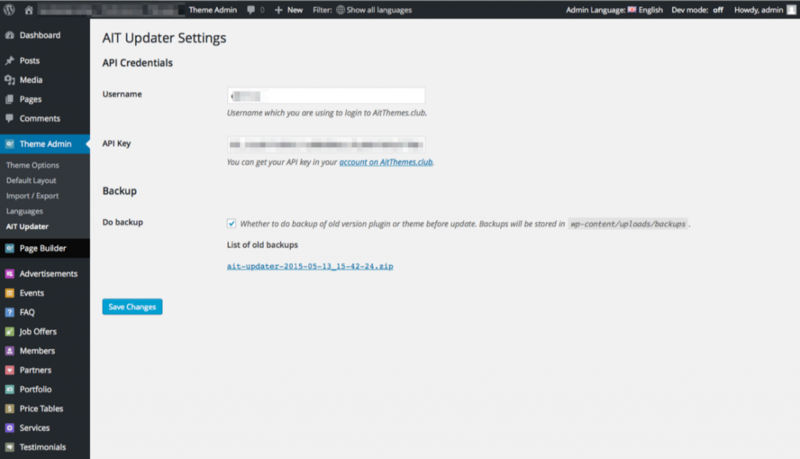 In case that you have bought the theme at Ait-Themes.Club, please kindly post your technical questions on AitThemes Support Forum. I’ve downloaded the Ait updater plugin, but it won’t accept the API from themeforest. The plugin only asks for ” AitThemes.Club API Credentials” and there is no option to fill in the Themeforest API. Is it allready working? I’ve bought the Doctor theme at Themeforest and would like to make automatic updates for plugins and theme. I’ve downloaded the Ait updater plugin, but I can’t fill in the API of themeforest. How can I fix this? I’ve bought the Doctor theme at Themeforest. The link to the forum doesn’t work. Also I cannot contact you via “Support” because I bought my theme at Themeforest, something I really regret right now. Because also on themeforest it is impossible to get in contact with AitThemes club. I tried to update manually, but it didn’t install the last (1.26) version, but an older one (1.24). It still doesn’t accept the API from Themeforest (AitThemes.Club API Credentials: The API Key is incorrect, it should be 64 characters long. You probably entered Envato Secret API Key to this field. You have to enter AitThemes.Club API Key to the field.) 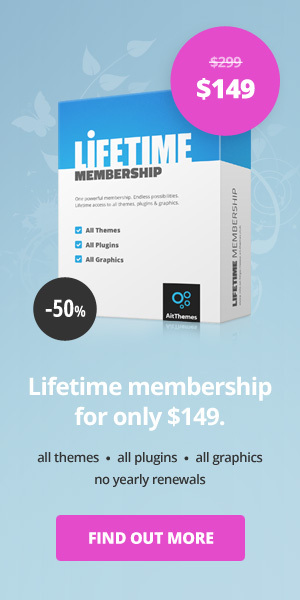 Can’t you just add the theme to my AitThemes club account? I can send you the purchase code of course. Please help me with this, because it’s a big problem at the moment. please provide us of your purchase code here in private message, i will trace your account asap. The one according your email is not connected to your purchase, probably you did not registered your purchase on themeforest.